What I love about these lil’ bites is that they are a little sweet, a little salty, a little cheesy and full of protein and other goodies. I can make a batch, keep them in my freezer and pop a few in the microwave for an easy, balanced brekkie. They’ve been so popular betwixt me and the mister that I’m thinking of inventing Christmas Brunch at my parents’ house this year just so I can make these for everyone and make a big deal out of it. To make my life more exciting, you see. Oh, and bonus! You can prep, cover and chill these Bisquick-based mini pies up to a day before baking them. But even if you don’t, they take like one nap’s length of time to make. And that means more time to wrap Christmas gifts, drink hot cocoa, deck the halls or, well, nap. A few of my favorite things this time of year (unless, of course, those naps consist of dreams about bears chasing you. In that case, I suggest skipping the nap and just drinking some coffee). Heat oven to 350°F. 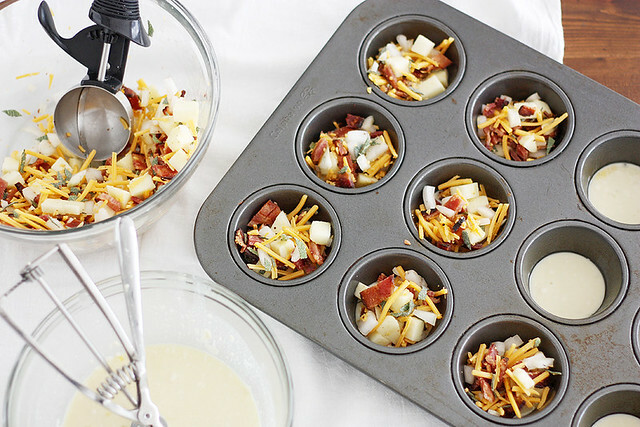 Lightly grease the cups of a 12-cup muffin pan with cooking spray. 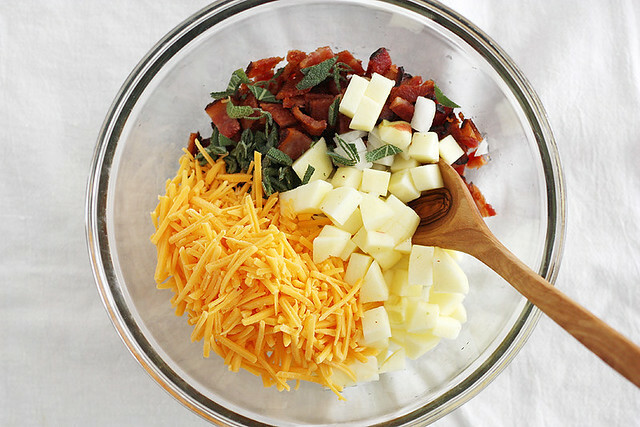 In a large bowl, stir together bacon, apple, cheddar cheese, onion, sage and salt. 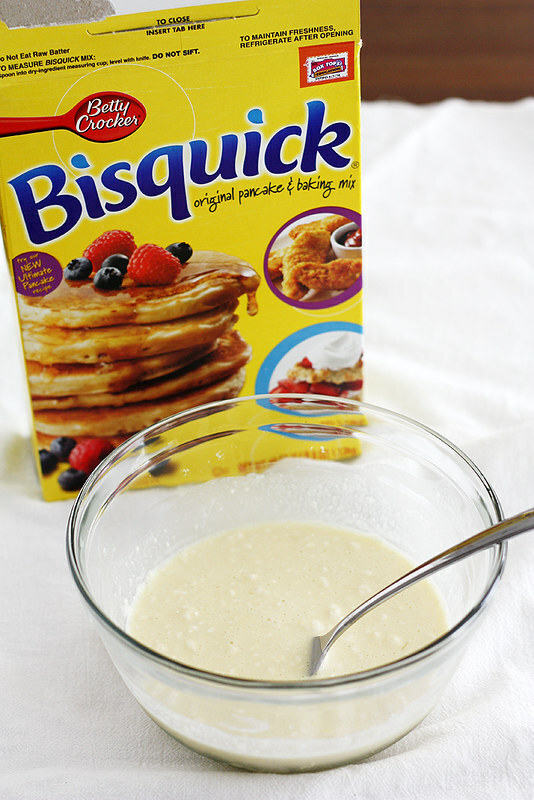 In a separate medium bowl, stir together Bisquick, milk and eggs with a fork until well blended. Spoon scant tablespoonfuls of the Bisquick mixture into the bottom of each muffin cup. Top with about 1/4 cup of bacon mixture. Top with remaining Bisquick mixture. Bake 20 to 30 minutes until a toothpick inserted in the center comes out clean and edges are golden. Cool 5 minutes in pan; transfer to a cooling rack to cool slightly before serving. These totally look like something I’d want to make on any given weekend morning. So easy but with crazy good flavors! Thanks for sharing. Well this looks simply heavenly! What a great combo. I can’t wait to try it! I want them ALL! These are most excellent! OMG just wait until your pregnancy makes your dreams sooooo crazy! I was having such vivid dreams the whole second half of my pregnancy. I wish I would have dreamed up this recipe! Looks great! Girl you nailed it: unique flavor combo, easy to make, and even easier to eat! Love the apple + bacon + cheddar and the fact that the “crust” makes itself. Sold! This flavor combo! Totes amazing! This is a solid breakfast right here! Ali — It just makes the weekend that much better. 🙂 Thanks, friend! Carrian — I was nervous the combo would turn out weird, but it totally works! Thanks so much! Erin — Thanks, lady! They make me want to put apple + bacon + cheddar in everything! I’m coming over in 5 to eat ALL of these. And give you big hugs. Oh what I wouldn’t give to have one of these for breakfast! Yum! Who doesn’t love a mini breakfast cake? I could down 6 if these for breakfast! They look too yummy. These are sooooo simple and perfect for a great breakfast. I love small bites! These look so scrumptious! These would be so perfect for little appetizers at a party too!! Tell your husband I’ve had the getting chased by a bear dream. (we were camping in the woods at the time!) These breakfast pies sound fantastic! I spy these in my Christmas morning future! Marie — Good thing they don’t take long to make! 😉 Thanks, doll! Belinda — Right? Everything in mini form seems to taste better. 🙂 Thanks! Maria — I know; I love that they’re so versatile! More opportunities for me to get them in my belly. 😉 Thanks, friend! dishing up the dirt — He’ll be glad to know he’s not the only one (although, while camping? *shivers*) Thanks, dear! Love this combo of flavors happening here, this would be a great holiday morning breakfast treat! Oh my gosh, that cheese!! Man, they look good. I’m not surprised you’ve been dreaming about them. Pamela — I AGREE. 🙂 Thanks, love! Sarah — Ha, I know! Sympathy dreams, I guess? 😉 Thanks, doll! I’ve totally been in a breakfast rut lately! Me and peanut butter toast are in the middle of this love/hate thing right now. I love that these can be made for the week ahead – they sound delicious! Woah, pie for breakfast? What’s not to like about that? It’s even better with the flavor combo you have going on here – they sound amazing! Mmm! I love the impossibly easy mini pies! These look awesome! Well, you already know how I feel about breakfast. And bacon. And cheese. So…’nuff said. These are the cutest, I love mini food! Mmmm, I get a little tired of the redundant breakfasts I have on the weekends too, love these for a little change up! I would dream about these too! What a phenomenal breakfast. I could have this every morning! My breakfast-loving self is now totally appalled that my tweenage self didn’t give breakfast a first, second or third thought. What was i thinking?! This has all the best of breakfast flavors in one! Liz — Oh man, me too. I mean, I love me some PB toast but every.single.day is getting real old. Thank goodness we have choices! Stephie — Yep. Me and you. Wavelength = same. Laura — Me too! 🙂 Thanks, dear! Nicole — A little change-up in the morning food routine is sometimes the only reason I get out of bed on the weekend. 😉 Thanks, friend! Joanne — Right?? I like to think I’m making up for my past transgressions with these breakfasts. 🙂 Thanks, doll! Julie — Yes and yes. I think both. 😉 Thanks, friend! Loving these pies. I could see myself making these then eating them all week for a quick breakfast. Great recipe! I want to carry these around with me in a hand basket. everywhere. I am a breakfast girl too…and my goodness…I’m going to be dreaming of these tonight! They look so good! I just want to eat ALL of those.. gosh this is perfect for my fam.. The hubs loves breakfast to go and bacon..
Alexe — Good plan! 🙂 Thanks, dear! Monet — Thanks so much! Erika — Same here! My husband was pretty pumped about them. 🙂 Thanks, friend! These are genius, Stephanie! I think I might have to make them for Christmas morning! This is my kind of breakfast! I think I may need to add these to my Christmas brunch menu! 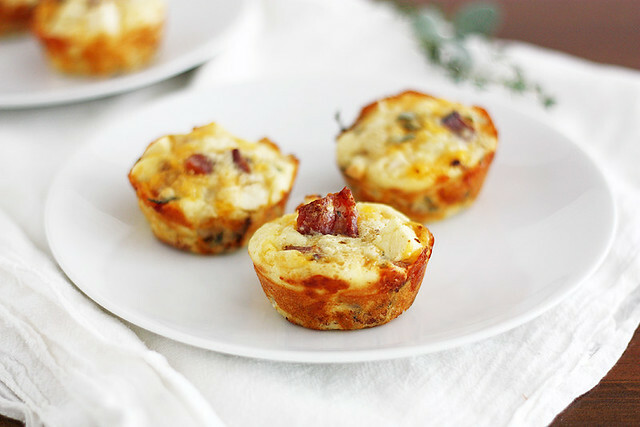 These look like the perfect little breakfast bites! I’m even betting that I can make these and freeze them and then heat them whenever I want to eat them! Everything about these pies is making me deliriously happy. I would like to make these as appetizers for Bunco. How long would they need to cook in mini muffin tins? Judy — Great idea! My rule of thumb with mini muffins vs. muffins is about half the time. So my guess is that they’d only take about 12 to 15 minutes to bake, but the best method is to just watch them and take them out once a toothpick inserted in the center comes out clean. 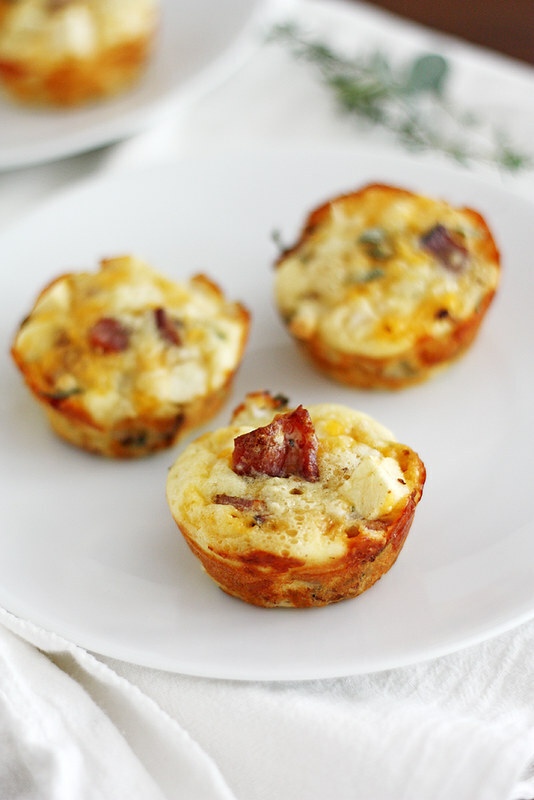 I was looking for something quick, easy and tasty to make for breakfast and these were it. Not to mention I had all the ingredients on hand. These were delicious! Perfect for breakfast or brunch! And the apple…yummm! This looks great! I’d love to try but I want to make them for the following work week. Something easy that I can just pull out of the fridge or freezer, heat up and go! You said that you can take them out of the freezer and put them in the microwave. Are they saugy? Do you put them on defrost? I guess my question is, if I store them in the freezer after they’ve been cooked- how do I get them to the point where they are edible and yummy? Can you store them in the fridge after you’ve already baked them? If so, how long and would you just microwave them? Julie — Good questions! It’s honestly been a while since I’ve made these but if memory serves, I just popped them in the microwave from the freezer at 30 second bursts (not on defrost) until they were warm. I didn’t want to overcook them because they are cooked eggs and they tend to get rubbery when reheated. You could also just leave them in the fridge and do the same (maybe in 15 second bursts, though, because they’re not as cold). Hope that helps! Enjoy! Stephanie, can you advise what the substitute would be in the case of using flour instead of Bisquick? Also the amount of baking powder or soda? Thanks so much! Vickie — Hmm, I really wish I could help with that but I just don’t know. Maybe try Googling homemade Bisquick mix and using that? So sorry I can’t be of help! I made these this morning and they were so good, I posted your link on Facebook. These have endless possibilities for vegan, gluten-free, etc. Great job, Stephanie! The apple does this magical little thing as it cools. It gets sweeter and really adds a delicious taste to the little pie. So glad I found this, especially with holiday weekends coming up in the summer. Margaret — Oh yay! I’m so glad you liked them. They are so versatile and perfect for holiday gatherings (and I agree about the apple — so good :)). Thanks so much!